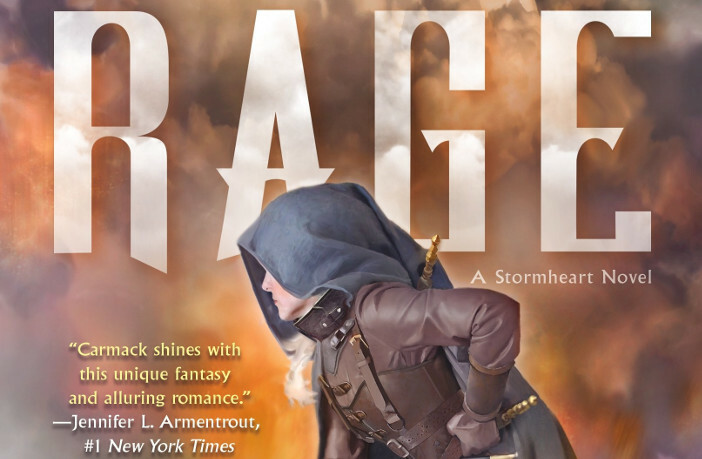 RAGE, the sequel to Cora Carmack’s ROAR is less than five months from being released, and Tor has released an excerpt from it! 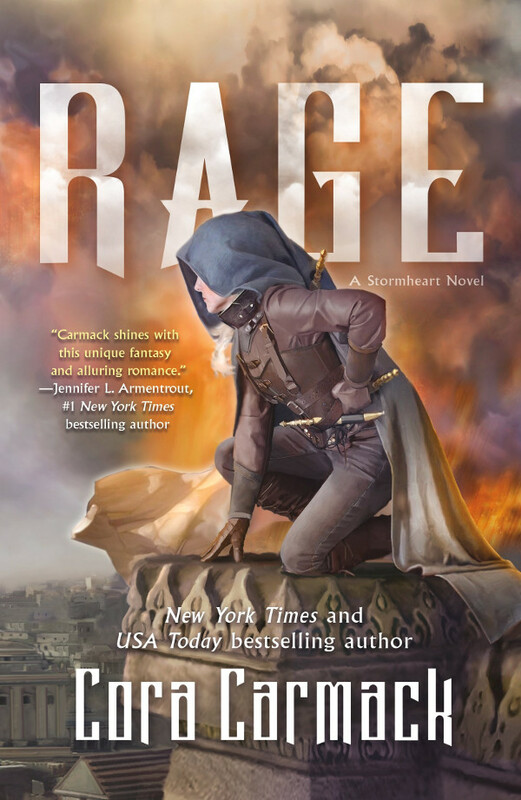 Cora Carmack‘s second book in her first Young Adult series, Roar, is coming in August, but Tor just released a rather lengthy excerpt from the book, which takes us on a journey through Aurora’s eyes. Our protagonist has a lot to deal with, including the ongoing struggle to people of Pavan, her involvement with them, being the princess, and maybe even a “little” romance. Sweat gathered along the back of Aurora’s neck as she followed her fellow storm hunters through the swaths of people to the growing settlement that edged the city of Pavan. The air hung heavy with impending rain, but that was not what made Aurora struggle to pull in a breath. They assailed her from every direction—they pulled at her from the earth, laying invisible tangles for her feet, and pressed at her from the air, prickling over her skin. Overlapping whispers clashed with louder bellows and pleas to form a cacophony that ground nearly all her thoughts to a stop. It was difficult to discern the difference between the crowd of living people around her and the swarm of spirits that came with them, but she knew it was not normal for this many unsettled souls to gather in one place. Either a great many people had died here in recent weeks, or these souls had followed their surviving loved ones here after they fled their destroyed homes as remnants. Perhaps it was a combination of the two. The remnant camp clung to the exterior walls of the city of Pavan like a wounded arm bandaged close to the body. This place felt wounded too. It was in the air, in the earth, in the creeping puddles of water that made mud of the places where people had done their best to create homes from whatever they could salvage. Aurora felt the spirits of the dead most clearly, but in the last few weeks her ability to sense living souls had grown as well. The desolation here had a taste, a bitterness that she did not even have to search for. It was there every time she opened her mouth to breathe. People had made tents and lean-tos from whatever materials they could scavenge. Ripped and patched blankets passed for roofs in places, while mismatched pieces of wood, tied together with string or torn fabric, were the nearest thing to walls. Most hadn’t bothered with walls, opting instead to focus on sheltering themselves from the sky as much as possible, but Aurora knew with certainty that none of these structures would hold up in a storm. In fact, she had the feeling that this little community had been rebuilt on its own bones more than a few times. There was more despair in this place than any one patch of land should ever lay claim to; that it was in a place she used to call home shredded something inside her. She pulled her gaze away from the remnants, and found the deep brown eyes of the man who had followed her across the wildlands without a word of complaint, no matter that she had yet to tell him why. She had yet to tell him so many things, and her heart clenched at the uncertainty of what would happen when she did. Would he still be willing to follow her anywhere when he knew how many lies she had told? Kiran, the man she had first known as Locke, stopped where he had been walking ahead of her, backtracking until he stood in front of her. “You do not look well,” he said. Kiran’s dark eyebrows flattened into fierce lines, but the straight press of his lips twitched up on one side, cracking the otherwise gruff mask he wore. He stood firm for a few moments more, then he dropped his folded arms, his shoulders softening into an arch as he bent down to graze his lips across her temple before dropping lower, to her ear. He whispered, “Do you want me to flatter you, princess?” The question was a low rumble that sent shivers across her skin. Skies, his obsession with that nickname would be the death of her. It produced the most bizarre mix of nostalgia for their time together in the wildlands and festering guilt for the truth she had yet to tell him—that she truly was a princess, or at least she had been, before she had left Pavan at the mercy of its enemies. Now she was not sure what she was. Did it matter that she was a princess if her kingdom had fallen to another? “Among other things.” He shot her the most mischievous grin. Her cheeks flushed with heat, and she tried to laugh it off, but at that moment they approached a particularly populated area of the camp, and the crush of souls made the air close off in her throat. Aurora took a few hard blinks, trying to focus, and managed to scrape in a raspy breath, followed by another. She did not know how to explain to him the way it felt to be this surrounded, this inundated. She imagined it to be like swimming deep into the ocean, the heavy pressure of the water pushing at her lungs and her ears harder and harder until they felt as if they might burst. No, no, that was not quite right. It was more like sensory overload, as if her sense of hearing had increased, and now everything was too loud, too close. Only what she sensed was so much more complex than sound, or sight, or smell. She felt . . . yearning and regret and wave upon wave of hopelessness. She saw fragments of memories and lives and loves. Spirits, new ones especially, had a tendency to dwell on their passing, so again and again and again she plunged into the misery of their deaths, dragged unwillingly along for the ride. Even when she managed to put up a block, there was such painful energy here that it made her feel raw and worn out. Which left her with too little strength to block the other souls she could feel—the ones that were not grieving or coping or following loved ones—the ones that had long ago let go of their human lives and become something else entirely. Mangled by fury and knotted up in lust for power and revenge, these souls were not as close by, but it did not matter. Their presence loomed so large and dark and magnetic—she knew if she dared to use her power to call a storm now, it would be one of those souls that would answer. She was not sure she would be able to stop them. No. They absolutely could not draw attention to themselves. She had noted on their arrival the blue Locke flags that now flew atop Pavan’s city walls. But it was not only flags that enforced the change in rule; Locke soldiers stood on guard at the gates and occasionally made sweeps through the camp. She had yet to recognize anyone she knew, but that did not mean they would not recognize her if they saw her. “I am fine. Only . . .” She cleared her throat, knowing she had to give him something or he would never give up. “You remember Avira?” she asked, referencing the spirit witch he had sought out when she had taken the heart of a skyfire storm in the Sangsorra desert, manifesting the incredibly rare ability to take the heart of a storm not by the traditional means of defeating the storm to capture the relic Stormheart it leaves behind, but by literally taking the storm into herself. Kiran did not talk about it much, but she knew that night had been traumatizing for him, not to mention her remaining unconscious for days with a mimicry of a lightning storm where her heart should be. It was a wonder he had not run for the hills before now. Aurora fought not to wince, and in her fatigue just ended up giving a long slow blink. Their eyes met, and he looked at her with a knowing grief that made her want to collapse into his arms right there in the middle of everyone. Instead, she let herself lean on him as she took another step forward. “We can set up camp farther away,” Kiran suggested. “It will give you some space. And the Rock is too conspicuous anyway.” The hulking metal contraption that passed for a traveling carriage was quite unusual. Some part of her felt like she should argue because that was their way. Even when they agreed on things, they still argued, examining every aspect of a situation until it had been exhausted. But she was the exhausted one now, and his plan truly did seem reasonable. He was not insisting on the location only for her sake. She did not want him coddling her. She could not afford that. If the presence of souls was just as numerous inside the city, she would have to learn how to deal with the effects quickly, because she could not wait any longer than absolutely needed to get inside the city and find the answers she required. Something had happened to her mother. There was no other explanation for how the Locke flags could be flying. Queen Aphra was a proud and powerful ruler above all else, and she would not part easily with her crown. Not unless . . . Aurora had to stop thinking about the possibilities or she was going to be ill, right there next to someone’s home. She could not let herself waver now. She imagined it not unlike the preparation one took to battle a storm. The other hunters had taught her tricks and put her through training and endurance exercises, but it the end, they said it always came down to which heart was stronger—yours or the storm’s. She had to face this the same way. She did not know what waited for her back in the city of her birth; she only knew it was not for the faint of heart. “Let’s go find a spot to set up our camp then,” Aurora said. The sooner they got settled, the sooner they could get to work, and she could do what had to be done.